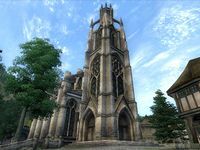 The Chapel of Stendarr is in the western end of Chorrol across from Jirolin Doran's house. This chapel specializes in Endurance and Strength. The building is divided into the Chapel of Stendarr, the Chapel Hall, and the Chapel Undercroft. With the Knights of the Nine official plug-in, a few books are added to this chapel, and two new people take up residence here. The differences are noted below. The three front doors of the chapel reveal an entrance and the main room, two steps below and ahead. A short set of stairs in the middle of this area leads to a small hallway with two doors on the north wall to the Undercroft and the one on the south wall to the Chapel Hall. The large cathedral altar sits at the end of the main room, and an altar to each of the Nine Divines surround the main room. Otius Loran, Gureryne Selvilo, and Orag gra-Bargol can often be found here. The first room in the Chapel Hall is a storage/dining room, with barrels containing food; two in the northwest corner, two in the southeast corner, and another in the southwest corner, next to two sacks that also hold food. The two wine racks also in this corner hold ten bottles of cheap wine, seven bottles of Surilie Brothers Wine, and three bottles of Tamika's West Weald Wine. The table in the middle room is set with two loaves of bread, five pears, a sweetroll, two bottles of Surilie Brothers Wine, and a bottle of Tamika's West Weald Wine. The doorway on the south wall leads to two sets of stairs; the one to the east leads down to a small bedroom with a single bed in the northwest corner. The chest next to it, with a bottle of Surilie Brothers Wine on top, contains clutter. The cupboard on the curved wall contains clothing, and the desk next to it (with a loaf of bread sitting on top) contains clutter and/or a common book. The set of stairs to the west leads to a small room with a single bed in the north corner and a clutter chest next to it, containing the skill book Notes on Racial Phylogeny. The desk on the curved wall contains clutter and/or a common book, and the cupboard next to it contains clothing. The door directly south of the main entrance room leads to a large bedroom with a double bed on the south wall. The chest of drawers in the northwest corner contains clutter and has two bottles of Tamika's West Weald Wine on top, and the cupboard next to it contains clothing. The chest in the southeast corner and the one in the northeast corner with pumpkins on top contain more clutter, as does the desk next to it (along with the possibility of a common book) and on top of it sits two apples. In the main room of the Undercroft there are four tombs along each side of this room, with a ninth opposite the doors and a zombie wandering. In the middle of each side is a set of stairs leading down to another two small tomb areas. The western one has three more tombs, two altars, and another zombie. The eastern one has two more altars, another zombie, and three more tombs; the southern tomb is the place Francois Motierre is revived in The Assassinated Man. With the Knights of the Nine official plug-in, the Gauntlets of the Crusader are added to the northwest corner of the chapel, surrounded by bouquets and candles. Areldur can now be found near the main altar. In the Chapel Hall, the books on the bookshelf have been replaced with The Song of Pelinal volumes 1, 2, 4, and 5, and volume 6 is on the dining table, along with a copy of Shezarr and the Divines. Kellen can often be found in this room, and the western-most bedroom becomes his; his single bed here is possibly unique, because a stool was placed inside it so that Kellen can sit on the bed as well as sleeping in it. Both the bed and the stool are owned by Kellen. Kellen's presence can make retrieving the skill book tricky, because he spends his entire day staring at the chest which contains it. This page was last modified on 8 July 2018, at 14:26.